All the practical information you need to know about Blue Mountains National Park. Take the M4 and the Great Western Highway for Glenbrook, the southern side of the Lower Grose Valley, Katoomba and Blackheath areas. The Southern Blue Mountains area is accessed via Oberon or Jenolan Caves. Take the Bells Line of Road for the northern side of the Lower Grose Valley, and the Mount Wilson area. You can also take Bells Line of Road to Bell, then connect with the Great Western Highway via Darling Causeway. Follow the Great Western Highway east toward Sydney. You can also follow Chifley Road from Lithgow, which becomes Bells Line of Road. Darling Causeway connects the highway and Bells Line of Road between Mount Victoria and Bell. Roads into Blue Mountains National Park can be busy, especially on weekends and public holidays during summer. For up-to-date traffic information, we recommend you visit the Live Traffic NSW website. Depending on which area you’re visiting, Blue Mountains National Park is accessible from a number of stations including Glenbrook, Woodford, Faulconbridge, Leura, Wentworth Falls, Katoomba and Blackheath. Visit the Transport NSW website to plan your trip. $8 per vehicle per day applies only at attractions in the Glenbrook area. All Blue Mountains National Park visitors planning a long hike, off-track or overnight adventure, or visiting a remote part of the park, are recommended to fill in the trip intention form and carry a Personal Locator Beacon (PLB). Find out more about hiring a PLB and completing a trip intention form on the dedicated iPads available at Blue Mountains Heritage Centre, Katoomba Police Station, Springwood Police Station. after hours from the Police Stations at Katoomba and Springwood. Keep well back from cliff edges and waterfalls at all times, especially when taking photos. Please stay on tracks and be aware of your surroundings and footing. 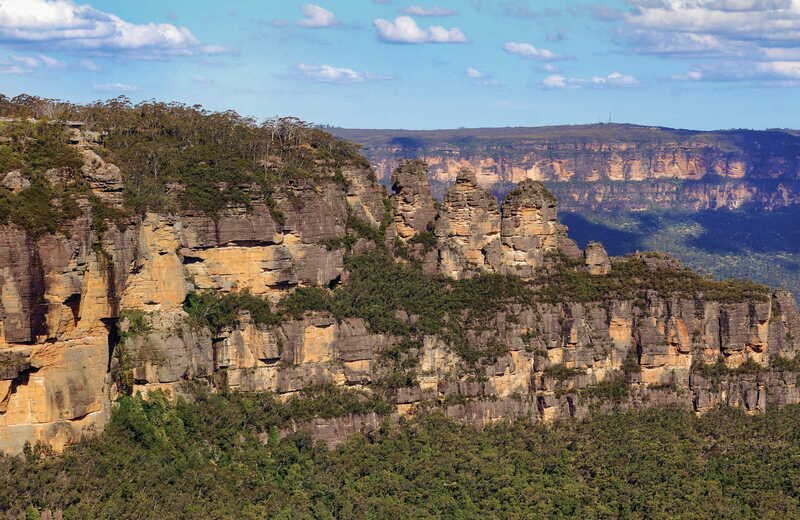 Katoomba is at the heart of most of the stunning natural attractions that make up the Blue Mountains National Park. You can admire deep valleys, sandstone plateaus, waterfalls and native animals from the many walking trails and lookouts near Katoomba.